"Bless you Dan. OB Son." 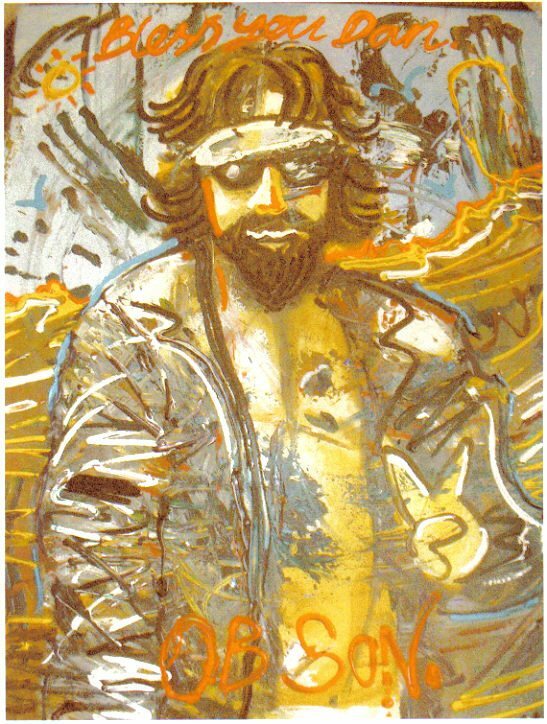 Portrait of Danny "The Walker" Woodyard by unknown artist, 2003. OCEAN BEACH, CA. There will be a small vigil tonight at 6 pm at the site where exactly 6 years ago, a well-known homeless man in Ocean Beach was gunned down and killed by San Diego police officers. Danny “the Walker” Woodyard was filled with bullets on West Point Loma Avenue near the intersection with Voltaire Street, a few yards from the entrance to north beach parking lot. Danny was a well-known homeless man, who was always seen walking around the community, hence his nickname. The morning of Feb 4, 2003, he had been dumpster diving with his only tool, an old knife. Thinking he was a drug dealer they were looking for, Danny was confronted by police officers, who ordered him to drop his knife. What happened next was viewed by dozens of OB residents called out to their porches, front doors and windows by the noise of the confrontation. On February 4, 2003, police officers shot and killed Danny as he too was supposedly advancing on police with a knife. Although, that incident occurred in front of dozens of OB residents, who were outraged by the blatant killing of a known homeless man, slightly mentally off, who had been “dumpster diving” that morning with his digging tool, a knife. I’m hoping someone who was at the Wed night vigil will give us an account. Man, it’s already been 6 years? I remember that day vividly, and the march that followed. I still see that stone bearing Danny’s name on it where his murder took place and it takes me right back there. How’s this for a mindblower…. My friend found this painting in a thrift store for ten bucks today and I became obsessed with finding out more about it. Through networking it on Facebook, another friend sent me the link to this article. I am trying to track down who the Artist is now. Try talking to Colleen at the Green Center, 4843 Voltaire. You are aware of what happened, yes? Older Article: The Whole World Is Rioting … Why Aren’t We?